Brand Balance is a rostrum where ideas come into play and branding manifests into innovation. A ThinkTank to ensure good businesses prosper, Brand Balance shatters the glass ceiling by creating result driven strategies for both visibility and value. The intent is to: Fill the gaps in communication needs for brands. Analyse brand value, conduct a third-party audit to evaluate strategy and then design a better alternative. Be the Brand Thinktank, provide disruptive ideas, scale strategy and add holistic value by providing a common platform for uncommon thinking. We’re daring, driven and disruptive - let’s journey across the ordinary, together. To be genuine, be vulnerable. To be vulnerable, unlearn and learn every day. Must deliver if we promise. Be unapologetically transparent. Condense to the meaningful and balanced. Conversations lead to conversions. Go beyond the ordinary. Take risks. Do what you love. Growth is proportional to kindness and humility. What are we, if not human. Every stakeholder is an equal partner. Balance is important. 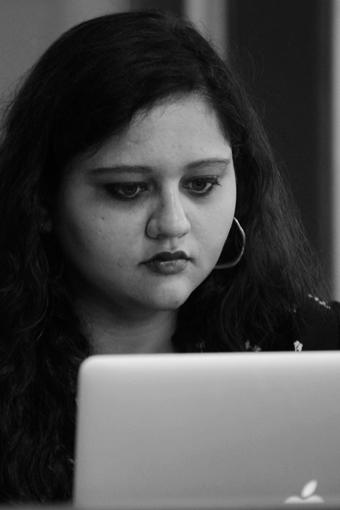 Creative & passionate Storyteller, Aanchal Gupta is a Digital Marketing Professional with over 7 years of experience in result driven, real-time, cross channel campaign management. Having worked with the Chief Minister of Rajasthan Smt. Vasundhara Raje and Government of Rajasthan as Officer on Special Duty to CM, Aanchal's strong grasp over communications in the public and corporate domain persuaded her to turn the dream of establishing her own Branding Firm into reality. Writing is her love, travelling is her yoga and building strategies that create both engagement and influence is her favourite sport. Brand Balance works on a co-relation environment, the core team consists of highly skilled and passionate members who are experts in their field of work. Apart from the central team, an expert network of resources that have achieved the best in their fields of work are engaged on project to project basis.